During the Second World War, my father, Frank Dawson Bliley, started showing home movies in the basement of our house at 965 West Arlington Road in Erie, Pennsylvania. They were really rented 16 mm films. He wanted was to boost morale of the neighborhood kids who were tired of all of the scary things they were hearing about the war. The films were a mixture of Westerns, science-fiction, and comedies, with a couple of cartoons thrown in. At first it was just the kids from within several blocks, but word soon got out and the "neighborhood" grew to a radius of several miles. My dad and mom did not mind the additional kids as long as there was room. The movies continued after the War and into the early 1950s. The photo on this page is one that was taken sometime in the Winter of 1949 or 1950 for an article in the local Erie newspaper. The photographer waited for just the right moment and caught many of the 65+ kids with delightful expressions on their faces. What a delightful scene, but the free space in the basement was about 600 square feet. The projector was located next to the furnace at the rear of this photo. There were a temporary set of "house lights" controlled by a couple of toggles switches suspended from the ceiling near the projector. The screen was hung over the tables in the laundry area that were used for sorting and folding. We had a few home-made wooden benches that I am sure some of the kids were sitting on, but what about the rest? Maybe, we had eight or ten folding chairs, but that is a long way from enough seats for everyone. Best downloaded and viewed off-line with a graphics program. You may not see the entire photo in your browser. Want to HEAR the kids? 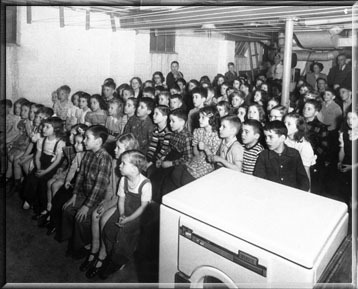 Click here to listen to a recording made on April 13, 1945 by Isabelle Bliley about the kids movie favorites and a patriotic dedication to President Franklin Roosevelt who died the day before the kids' movie night. I am the little boy in the coveralls sitting in the front row next to the washing machine. I think the short kids, like myself at the time, were asked to sit up front. Form the date on the photo, I was about five years old. My dad is standing in the back of the room to the left of the projector. He and only two kids are looking at the photographer. It must have been a really good movie! If any of you visiting this page can identify yourselves or a relative in the photo, I would be delighted to know who they are and their location in the photo. I would also love to receive any stories you may have relating to the "Bliley Home Movies" and would consider adding them to this page. In the family archives in Boulder, Colorado, I discovered three items---a marketing photostat announcing the movie event for November 1945, an undated list of invitees, and an undated letter announcing the beginning of the movie theater season. (It appears to be for January 7, 1944.) Click here to view a gallery of these three items. Just think of the logistics of having more than 50 kids over for an evening of movies; not just once, but perhaps once a month for years! Getting all these kids to the house and picking them up. What to do with all of their coats, boots, leggings and hats in the Winter time? Directing and controlling all these kids to the bathrooms. Believe me, there were a lot more kids than toilets in the house! The many phone calls home the kid's made to mom and dad to tell them the show was over, and it was time to pick up them up. This date is the day after President Franklin Roosevelt died. My mother decided to record interviews with the kids about the the night's movie, then after the movie perform a salute to the president. She made a record recording to remember the day in posterity. Click here to listen to this 14 minutes of fun, and later moving, recording. My dad was a serious home movie hobbyist who had a small collection of silent cartoons that we could watch whenever we wanted to see them. Usually, one of my older brothers would set up the projector and screen for me. I loved those cartoons and on my ninth birthday, he gave me a brand-new silent version of a B/W Woody the Woodpecker cartoon, titled, "Choo Choo Baby". This was the last gift I ever receive from him before his death four months later at the age of 49. That old cartoon is still in good condition, but regrettably, I do not have a 16 mm silent-film projector. "What was the movie being shown?" "Why is almost no one wearing eyeglasses?" "Where are these kids today?" Most of those questions will never be answered, but I do know that everyone involved had a good time, and that included the adults. I have spoken to a few of the kids who are now adults, that attended the movies. They all considered a night at the Bliley Home Movies as one of their cherished childhood memories. Thanks Dad! From all of us kids. After posting this page on my Web site, I posted a message on the Erie, Pennsylvania genealogy list server. The following was one of the most detailed and charming answers. on the questions you raised on your website. Considering the nature of the use, I expect that funeral homes & schools would have been willing to lend some chairs for the occasion(s). Also, based on my Yahoo map search (and my faulty recollection), a lot of those kids were within walking distance (1950's style) of your house; also, 2 or 3 kids from one family might well have attended. Again, parental direction: "Did you go to the bathroom before you left?" Remember, these kids weren't drinking sodas incessantly, so they probably "managed" to hold out just fine! Probably not many phone calls needed. Remember, a lot of kids probably could walk there -- and safely back, in the 1950's. Also, from my experience with my parents' carpooling, they checked beforehand to see when the kids should be picked up. for me. I loved those cartoons and on my ninth birthday, he gave me a brand-new silent version of a B/W Woody the Woodpecker cartoon, titled,"Choo Choo Baby". Have you tried contacting the studio that made the Woody cartoons? A good question, but I think getting an opportunity to watch was of utmost importance. In those days, if kids could not see clearly, they just moved closer to the screen (or blackboard) -- at least in my personal experience. Probably within walking distance (50's style).